Many people consider the choice of substrate to be simply aesthetic. However, the substrate has a greater effect than just decoration, and provides a microclimate environment that can affect the health of the inhabitants. Although choosing the substrate is partially a matter of the owner's personal preferences, it must also take into account the needs of the occupants. Burrowing species for example will prefer both a depth of substrate and a type that they can easily tunnel through. It might be important to have a very dry, easy to clean bedding such as CaCO3 Sand for a desert species. Some amphibians and reptiles will require a more humid substrate like Tropical Terrain to simulate rain forest conditions. In many habitats the ideal solution may be to provide a selection of diverse substrates at different levels. This will provide a variety of environments as well as a more natural and visually attractive living space. Simply disperse throughout the habitat to the required depth. Use the Komodo Humidity Gauge in conjunction with the Komodo Spray Bottle to measure and increase the moisture levels as required. 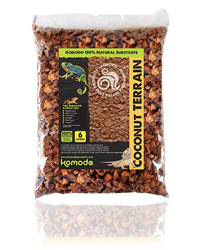 Spot clean daily, replacing soiled material with fresh Coconut Terrain. Change all bedding monthly or as required. Humid, warm enviroments usually require more frequent changes than dry surroundings. Note: Soiled bedding should always be disposed of in a proper hygienic fashion.